After claiming over one dozen lives in the Capital and affecting several persons in the Chandigarh region, the deadly disease of meningococcemia meningitis or brain fever has created panic in the city also. Mr Partap Singh Bajwa, PWD Minister, Punjab, has asserted that the Punjab Government had prepared a programme for strengthening and widening 1,100 km of roads in the state at a cost of more than Rs 1,000 crore with the funding from the World Bank. Lure of luxurious life and desire to give expensive gifts to their girlfriends allegedly led three teenagers to commit a number of crimes like chain snatching, mobile lifting and vehicle thefts in the city. Two of those were studying in class XI while the third had taken matriculation examination. Booking of a speed post article at the post office, located on the railway station, here turned out to be a nightmare for a local businessman, who was not only made to pay more than the stipulated charges but had to face the ignominy of being abused and threatened. Industrial production has been paralysed in this industrial capital of small-scale industries, thanks to the policies of the government. Protesting against “management’s inaction” over their long-pending demands, employees of all four public sector general insurance companies - Oriental Insurance, New India Assurance, National Insurance and United India Insurance-held a dharna outside the regional office of United India Insurance at the Ferozpore road here today. Thousand of followers of Jainism thronged the MGMN Senior Secondary School at local town where four women of the north India were baptized by the gurus of the Jains at a function organised by the local Jain Sabha. A meeting of activists of the Comrade Gurmel Singh and Comrade Joginder Singh Memorial Committee was held at Sanatan Vidya Mandir Senior Secondary School here on Monday. Mr Kartar Singh Buani Secretary, District Council, CPM Ludhiana presided over the meeting that was held to review the preparation of 16th martyrdom anniversary of the Gurmel Singh and his associate Joginder Singh who had laid their lives for the cause of solidarity and peace of the state on May 14, 1989. Food has already turned into a billion dollar industry, rivalling in turnover even the IT and the biotechnology. And Ludhiana is no exception with reputed food joints already having registered their presence here. With this, has also come the variety. Mrs Leela Wanti grandmother (nanni) of Mr Parminder Mehta, Secretary, Punjab Pradesh Congress Committee, died last night. She was 90. The Khanna police has arrested the third accused involved in the robbery took place on April 27th in which the robbers had robbed rupees twenty thousand and a car from a automobile dealer at G T road Khanna. A girl of Dhamot Khurd village, who was allegedly taken away by two youths from her house, is still untraced. The police has registered a case of abduction against two youths for allegedly kidnapping minor girl at the Payal police station. The girl, a student of Class X of SM Public School, Dhamot Khurad, is missing since May 6. A brother receivedi injuries while saving his sister from four miscreants. According to the information a married woman at Dehra Dun came to Aligarh to attend the marriage of her aunt’s son. Her brother and some other relatives have also came to attend the marriage. NOW that summer holidays are about to commence, children are taking their parents to toy shops. As parents survey the toys displayed in the shops, they find that Chinese electronic toys outnumber the Indian made toys. Max New York Life Insurance Company today celebrated its fifth founder’s day. Employees ad agents of the company visited blind school and also donated two water purifiers to the school. The two major factions of the Punjab and Chandigarh Colleges Teachers Union (PCCTU) are gearing up for the state elections for different posts of the PCCTU, scheduled on May 15, at Lyalpur Khalsa College, Jalandhar. As many as 500 teachers are expected to cast their votes for their favourite candidates. Students representing various student unions in the state today held a massive protest against the hike in fee structure of the ITIs and the proposed privatisation move of the state government at the Mini Secretariat. 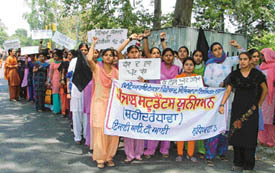 Students held a protest rally against the government’s privatisation move in Ludhiana on Wednesday. — Tribune photo by Inderjit Verma. Students of several schools attended career conference exhibition organised here today. Dr Gurmit Singh, senior lecturer, post–graduate department of Punjabi of A.S. College, Khanna has been allotted research project (minor) in Punjabi Language Topic “ Puner Sirjan Lok – Kathawan De Adhunak- Budh Da Saroop (1991-2000-Natak )” by the University Grants Commission. The chest unit and the Paediatrics Department of the Dayanand Medical College and Hospital (DMCH) organised a seminar on the occasion of World Asthma Day to discuss the causes, effects and new treatment modalities available for the treatment of asthma. A blood donation camp was organised by employees of Max New York Life Insurance Company at S.A.S. 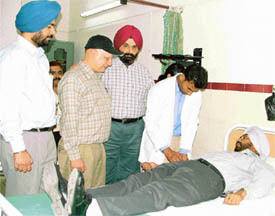 Grewal Memorial Multi-Speciality Hospital here today. At least 25 persons donated blood at the camp, which was handed over to the Civil Hospital for the benefit of poor patients.